On receiving information about the action of these groups at the riverfront, the police rushed to the spot and took into custody those who were threatening the couples and asking them to leave. 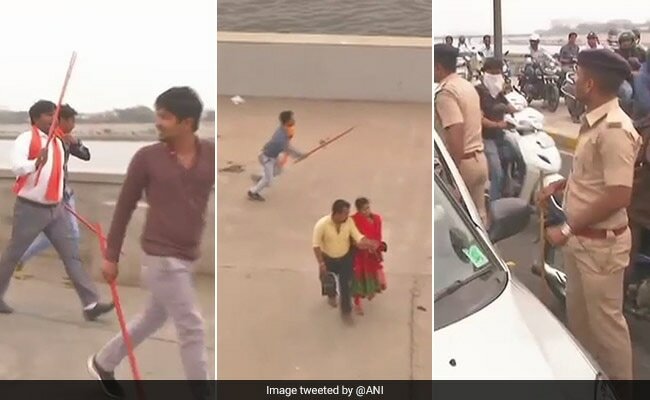 Ahmedabad: 10 activists of the Vishwa Hindu Parishad, or VHP and its affiliate Bajrang Dal were detained today after they allegedly tried to chase away young couples who had gathered at the Sabarmati Riverfront in Ahmedabad today for Valentine's Day. VHP claimed it only asked the couples to leave the spot, a popular hangout place for youngsters, and that its members did not attack anyone. An official at the zone-1 police said they detained around 10 people from the spot. "We have detained some people, and deployed adequate police force at the spot to prevent any untoward incident during the day," Sabarmati Riverfront Police Station inspector SJ Baloch said. In some videos recorded by passers-by purportedly of the incident, several people carrying saffron flags and wielding sticks could be seen threatening couples to leave the spot. The activists were also seen chasing away some frightened couples, who either ran away to save themselves or drove off in a hurry on their two-wheelers. The city unit of the VHP yesterday said it would stage protests on the riverfront against the Valentines' Day celebration which, the outfit claimed, was "against Indian culture". Taking responsibility for the incident, VHP media coordinator for north Gujarat, Hemendra Trivedi, said, "As announced by us, the VHP and Bajrang Dal members today held protests at the riverfront. We only asked couples to leave. We did not attack anyone." "Several of our workers were detained by the police. We are against the celebration of the Valentine's Day because it is against the Indian culture," Mr Trivedi said.